A busy Turkish cafe on Stoke Newington High Street that specialises in English and Turkish breakfasts. Kat lives nearby and is a semi-regular visitor here. Despite (or perhaps because of) the high density of Turkish cafes in the vicinity, Z Bar has maintained a high level quality over the years in terms of both food and service, and is very popular with the locals as a result. It's easy enough to get a table at 10:30am on a weekend but by 11am the main seating area is usually almost full, and there is a small queue of Stokeyites (families with pushchairs, Turkish cabbies and hungover hipsters) at the door. Thankfully the staff are very efficient and the wait is never that long. There is a downstairs seating area which rarely seems to be used in the daytime, plus a few tables outside on the street. On a visit in September 2012, Kat had her usual #2 English breakfast (sausage, bacon, fried egg, bubble, mushrooms and toast) from the set menu for £4.20. All the constituents were well-cooked and plentiful, but the bubble in particular is always a highlight and didn't disappoint on this occasion. Four triangles of toast was far more than she could eat but her extra-hungry companion stepped in to help. Breakfasts are served until 5pm, and such is the awesomeness of the bubble that Kat has never got round to trying the main menu, which is available from midday. There are five vegetarian set breakfasts as well as whatever individual breakfast elements you desire On Toast. Following a refurb in 2014, Kat can confirm that the breakfast menu remains happily unchanged and still good value. There is now a small bar area at the rear, advertising a number of craft beers for sale. 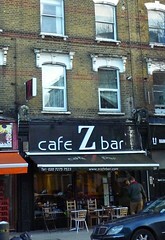 Z Bar also offers exhibition space for local artists and photographers. Last visited by Kat, August 2014. Opening hours taken from old website, September 2012. Last edited 2014-08-20 13:56:36 (version 4; diff). List all versions. Page last edited 2014-08-20 13:56:36 (version 4).